Online testing is coming up April 9, 10, and 11! Looking to practice? Video of the recent South Florida test is available! Correct response: What is the Great Salt Lake? Unlike most North American lakes, the Great Salt Lake is endorheic (it has no outlet besides evaporation). Thus, while the water can evaporate, the minerals in the water (like sodium) can not, leaving a body of water that has become more saline than the ocean. Swimmers can be more buoyant in these lakes than they would be in ocean water or fresh water, due to the increased density of the brine. Salt Lake City, Utah, is named after the lake. An average of 3.1534 5+-time champions (standard deviation 1.4216). An average of 5.0272 4+-time champions (standard deviation 1.9449). An early cutoff took place 5.249% of the time (or a 5-game winner will be left out). 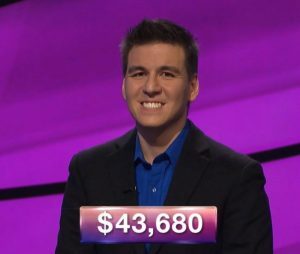 James Holzhauer qualified 70.718% of the time. Eric R. Backes qualified 80.688% of the time. Anneke Garcia qualified 57.095% of the time. Lindsey Shultz qualified 29.072% of the time. Dave Leffler qualified 11.324% of the time. Jonathan Dinerstein qualified 0.933% of the time. Effective in first on buzzer stats: James 50.00% (27/54), Alex 46.30% (25/54), Anna 3.70% (2/54). The first-day winnings record: $50,000 (Myron Meyer). The highest Day 1 Coryat score: $36,000 ($18,000 doubled), Wes Ulm. While I am not going to specifically publish “negative” stats, I will say that no records were broken during this game. 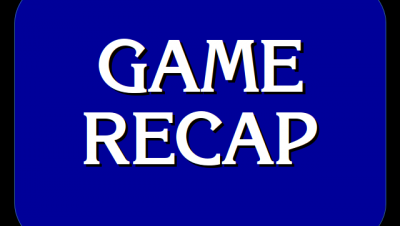 23 Comments on "Today’s Final Jeopardy – April 4, 2019"
The audience response to Alex Trebek has been particularly enthusiastic as of late. Could it be that the episodes currently being aired were recorded after the public announcement of his medical diagnosis? They were not. These episodes were recorded about a month before the announcement. I knew the answer immediately. Mother was born in Provo, Utah, and when I graduated from high school the whole family drove across the country from New York to California and of course stopped at the lake. I have a picture of all of us standing in it (not trying to float, as supposedly is possible). I knew James and his occupation sounded familiar. 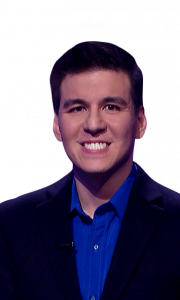 He was on a show that was on for only a few years in the spring called 500 Questions. He was from Naperville IL then. Now Andy, I know you’ll say it’s only easy if you know it, but c’mon, is there even a second guess on this FJ? I’ve seen one person almost go to the Salton Sea. I considered the Snake River. I’ve seen the new champion before. Is he another veteran of The Chase? A couple previous champions were. Yes, he was on The Chase. I’ve never heard of The Chase. I’m going to watch it this afternoon. Thanks for the info. He was also on the last year 500 Questions was broadcast. No player ever got through all 500 questions. 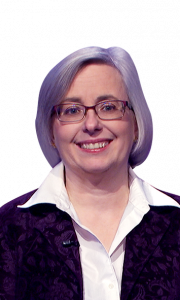 Pam Mueller and Ken Jennings were also on it. 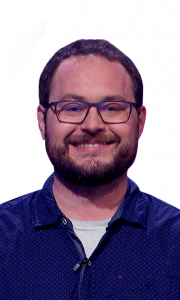 James was on the first of the 2 seasons of 500 Questions. Ha ha, me too. My boss at my first job had one, and no, I will not tell you what year that was. What was the text of the clue for the Karmann Ghia response? I have a feeling about this guy, I think he’s gonna be the guy who wins game after game after game. Good luck, James! Ahead of time what transpired on the show before it airs. The fact both Daily Doubles were found really early with only 2/3 of the board left put questions of perspective with if Alex was going to be able to prevent James from going overdrive the rest of the way through. I’m really not sure what was up with James’ numbers in terms of betting. It’s like dating back to Mike Maheu’s “Strip Jeopardy!” betting right there. But otherwise, we’ve seen two legit guys with serious betting in this season, Eric R. Backes and his $48,001, now this guy. This really got interesting, to say the least. I feel bad for Alex Koral. He faced a five time winner and defeated him in his first game and look who he meets in Game 2!